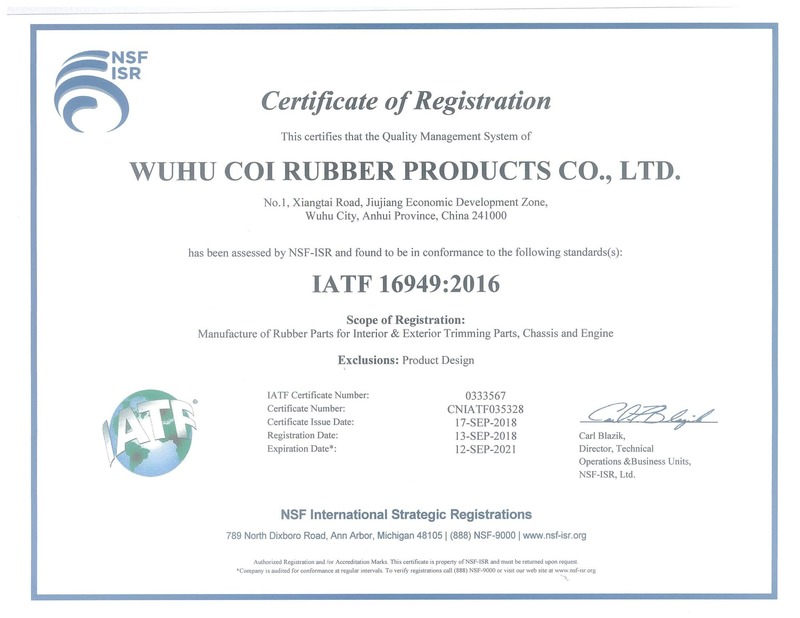 Formed Rubber Hose Material Selection – Coi’s formed hoses can be designed and manufactured in a range of materials and configurations depending on the function of the hose. Our knowledgeable staff has extensive experience in helping select the right material or materials needed to meet our customer specifications. Formed hoses can be produced in homogeneous configurations (single material) or for applications requiring increased durability and chemical resistance (i.e. high pressure, vacuum, oils, fuels, automotive) reinforcement and/or additional rubber layers can be introduced. Coi’s formed hoses can also be manufactured to industry specific requirements such as FDA, NSF or USP Class VI. In Mold – Molded hoses are common for high volume, non-reinforced hose applications. Our molded hoses are manufactured to a specific configuration or shape based on the hoses path. Compared to a straight hose that has been bent and distorted to fit the assembly envelope a molded hose will offer ease of assembly and reduced risk of kinking in application. Mandrel formed hoses are common for medium to high volume applications where the hose configuration calls for reinforcement. A mandrel formed hose begins as a non-cured tube like extrusion with a specific ID and Cross Section (wall thickness). As this “extruded tube” moves down the production line reinforcement is added followed by additional rubber layers. The non-cured tube is then cut to length and fitted onto a mandrel and cured to its finale shape. This type of hose is similar to a molded hose in the finale configuration is designed based on the path the hose will travel offering ease of assembly and reduced risk of kinking with the additional benefits of reinforcement. These types of hose are common for high pressure or vacuum applications and/or when the media being conveyed introduces the risk of material swell (i.e. oils, fuels, high temperature). Reinforcement: High tensile nylon fabric or cotton fabric . Characteristics: Abrasion resistant, weather resistant and zone resistant. It strong, of high pressure and durability etc. Applications: Widely used for conveyance of water, oil, air and powders in industry, agriculture, factory, mining and building etc.